Published November 1, 2016 By Anna T. This post may contain affiliate links. Regardless, I only recommend sites I've researched and/or used and trust. Konsus is a newer company I've been seeing around that has many remote positions available. These positions are also across many different categories, including data entry, graphic design, writing, research, and more. Konsus' jobs are also open worldwide. What Sort of Business Is Konsus? The first thing I do when looking into any work at home position is check out the business end of the company first. I like to know how they make the money they use to pay workers, what sort of services they offer to potential clients. So as far as Konsus is concerned, they appear to be a “middleman” company, maybe slightly similar to Upwork. Except, I don't believe you have to bid on projects here. The company has clients who need multiple workers for various projects. Konsus provides these workers. This is supposed to save their clients time and money on tasks they don't want to spend time doing, and also taking time to source workers to complete the tasks. Konsus takes care of it all. What Work at Home Jobs Does Konsus Offer? The data entry job listing specifically caught my eye. I get a lot of reader requests for info on work at home data entry jobs, and unfortunately there just aren't that many out there. How Much Does Konsus Pay? They do not list the rate of pay, and I was unable to find the info online. I'm sure it probably varies depending on what you're doing. If I can find details later, I'll try to get this updated. How Often Does Konsus Pay? The company pays workers once a month. Also, they have you covered for those situations where the client doesn't want to pay. It won't be your problem because Konsus pays you, not the client. How Much Work Will Konsus Have Available? This is one of the sticking points for most freelancers. You can find good gigs, but who knows if they will have steady work? Konsus does say they will have a steady stream of projects. What Is The Schedule at Konsus? It is supposed to be very flexible in nature, giving you the freedom to choose when, where, and how much you work. They also state you can decline any projects you don't want to take part in. How Hard Is It To Get Accepted at Konsus? Konsus claims acceptance is difficult, and that only two percent of applicants make it in. This could vary from position to position, but I've seen that they do interviews. Also, you'll have to complete an assessment determining you're qualified to do the job you're applying for. 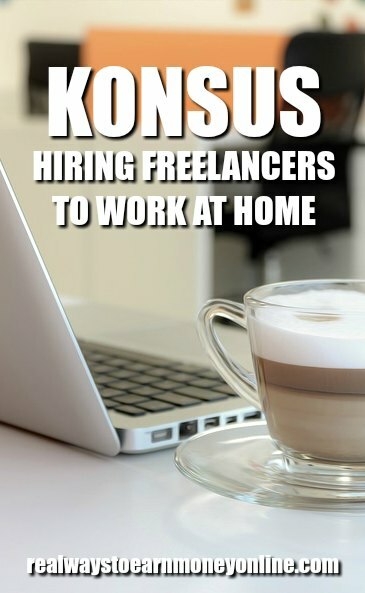 What Do Other Freelancers Say About Konsus? I'm not able to find much online yet, unfortunately, apart from these two interview reviews on Glassdoor. One of these lists a negative interview experience and the other was neutral. That's not enough for me to have a good idea on how things are here, so if you have your own feedback to provide, feel free! If you're interested in doing work for Konsus, go here to see the list of open jobs and apply. Good luck, and please share what you can with us about how things go for you. Contena – If freelance writing is what you're looking for, it doesn't get much better than Contena. This site is updated daily with tons of freelance writing and proofreading gigs. You can see the job listings on the main page, but if you decide to splurge and become a member, you can use promo code ways2earn at checkout to get 10 percent off any plan. Fiverr – This one is a little different. You can sign up and offer your services (pretty much anything you can think of that you're good at from writing, data entry, graphic design, and all kinds of other things). Price your base services at $5 and then add upsells that cost more to your profile to earn even more. Another blog post on this site with a list of freelance sites. I made it all the way through the application process to onboarding as a writer. During the application process, they were upfront about the pay being $10/hr. I thought this was quite low, but I was curious to see if I could talk them up to something better. I could not. They seem pretty desperate for good writing talent, to be honest. They are, after all, promising their clients access to the best 1 percent of freelance talent in the world. But for some reason, they won’t budge from the $10/hr pay. I highly doubt many of the best freelance writers in the world want to work at that rate. Maybe in their other services — PowerPoint, etc. — they can attract better talent because it’s less dependent on native speakers. Konsus says they’re “the future of work.” Apparently the future of work is working for less than minimum wage. It’s kind of depressing, if you ask me. If you are an experienced freelance writer, you can probably get this job and they probably will have a decent amount of work for you. Just don’t expect to make a living with Konsus unless you live in an area with a very low cost of living. Knowing I have guaranteed failure on any timed test and after reviewing the Glassdoor posters “concerns” with the flawed application process, I tried applying myself. As predicted I failed the test, but they don’t provide a score or any results. So I also took the free Cambridge TOEFL English test you can pull online for comparison and scored 95%, but I’m unsure if either is a legitimate gauge. Neither is the standard or a complete test (including all four parts). My findings, they ask if you are willing to earn $10 to $15USD per hr. On their site it appears they charge prospective clients $29 per hr. Both incredibly low rates. There’s no bidding involved like similar platforms, so one assumes income is based on volume. Again, if only 1% to 2% of applicants are eligible because of their high standards and testing, why do they pay so poorly? Unless a writer who is already working with them for a few months gives feedback, at this early stage, it will be hard to determine if this is a content mill scenario – that makes applicants jump through hoops to apply. Or a legitimate startup. That being said after reading this review below, pulling my rejection letter from spam and comparing all the grammatical errors and typos, one does wonder how stringent the testing is. Or how relevant. I have screenshots of the test if you would like to post. I applied to their researcher and content writing jobs. You’re required to submit a resume, explain a little about yourself, and take one English comprehension test and one pattern/reasoning test. Both tests are timed, so make sure you have about an hour and a half of uninterrupted time to take them. I’m not good at brain teasers (always found them silly) and thought the pattern test got more difficult with each section. If you excel at this sort of thing, you’ll probably ace it. Hi,i am very intersting for job ,so i need project to do it . I live in the caribbean and I have been looking forever for a stay at home job. You should try a group I am with called Trabajo en Pijamas it has different opportunities for people in the caribbean.